One of the largest growing industries at the moment for HD imaging is not the consumer market but the medical one. Doctors and surgeons want decent HD technology so that they can perform surgery and consultations remotely. 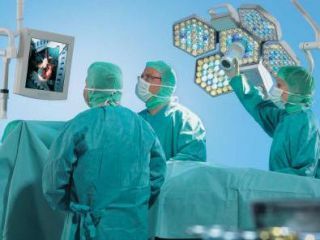 TRUMPF medical systems has trumped the rest of the medical world by introducing the world's first in-light HD operating room camera. Called the TruVidia, the cam works on 1080p resolution, with images captures in the widescreen format. "Integrated surgical suites now utilise HD endoscopes and HD routing systems: the in-light camera should be in the same format. "This brings consistency to the images and maximizes the quality for storage, reproduction and broadcast." The camera will help the likes of medical students gain a greater understanding of what they are seeing thanks to the hi-res imagery, while surgeons can conduct consultations, while looking at imagery remotely on an hi-def screen. The camera is integrated into the lighting systems in a surgery theatre and captures both still images and moving image. It can also be controlled remotely from a control panel.